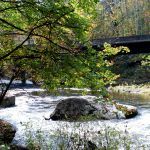 Ask fellow campers about "Mountain River Family Campground (formerly Secluded Valley RV CG)" and nearby attractions. Park has new owners that have made significant improvements. The bath house has been renovated and is one of the best we have seen. New laundry room is outstanding and includes iron, ironing board and soap. They have run fiber which gives the reliable and fast wi-fi. Campground is close to Blue Ridge Parkway. Only negative is no camp store but town of Spruce Pine is close. This is our favorite mountain campground. We camped at Mountain River Family Campground (formerly Secluded Valley RV CG) in a Travel Trailer. Must eat at Mountain View Restaurant at intersection of 226 and Blue Ridge Parkway. Beautiful secluded campground - very clean and well landscaped. Sites are mostly gravel and grass and level. The pond is stocked with fish and the sounds of the Toe River can be heard throughout. Folks were VERY friendly. There is no pool, but tubing in the Toe river is right there. Access to the river from most sites is limited due to steepness of the river banks. Some sites were seasonal, but all sites well kept. Owners were very nice and were very responsive and checked on us. Kids rode bikes around the pond - very safe atmosphere. Dog friendly. Some sites bigger than others, but can accommodate most. No cable, but an upcharge high speed wifi was GREAT! Preferred it to most crappy cable systems. 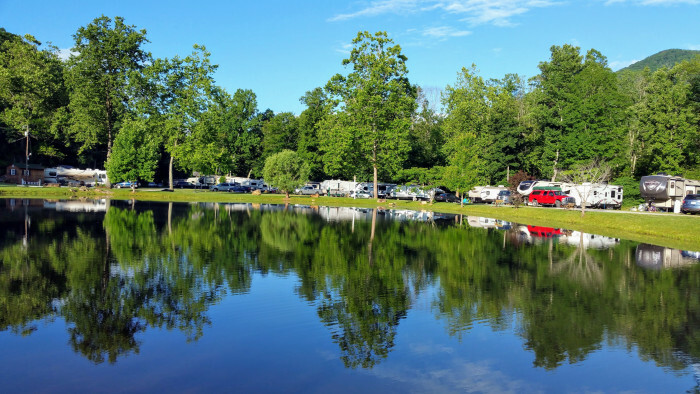 If you want to kick back and relax in a peaceful environment, you can't beat this campground. Will definitely stay there again! We camped at Mountain River Family Campground (formerly Secluded Valley RV CG) in a Motorhome. You are close to Linville Falls, Asheville, an hour from Biltmore, Mt Mitchell, Grandfather Mountain. Lots to see! New fiber-optic internet system is operational with multiple directional antennas throughout the park. Included speed is adequate for routine tasks, with faster speed available for an additional charge. New bath house and laundry room. One bedroom cottage with carport available that is also pet-friendly. We camped at Mountain River Family Campground (formerly Secluded Valley RV CG) in a Travel Trailer. This is a family run campground, and it is awesome. 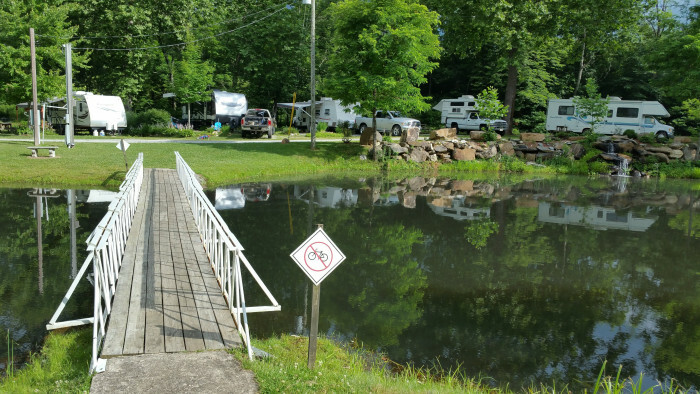 The family is all about customer service and the campground has great amenities. They thought of everything. 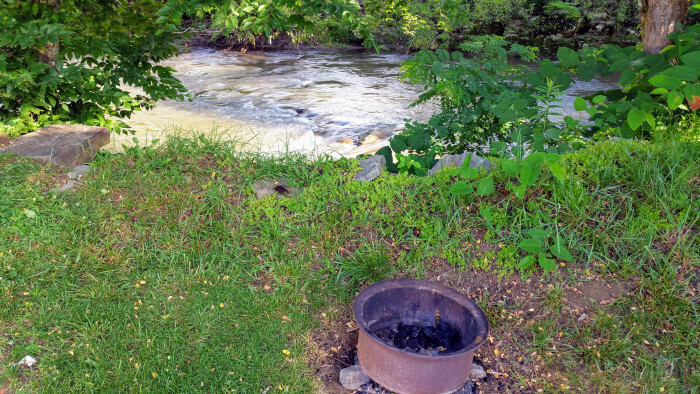 The campground is right on the South Toe River, and our site backed right up to it. We slept well listening to the river. 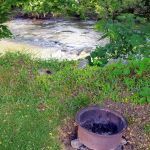 We could stand at our fire ring and see the river. Best bathhouse we have seen since Disney campground. 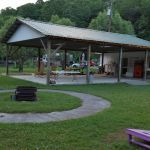 Nice laundry facilities and even a recreation building with games, puzzles and lawn games. This is a must see campground. We camped at Mountain River Family Campground (formerly Secluded Valley RV CG) in a Travel Trailer. 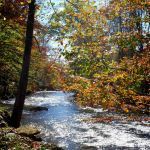 Plenty to do near by: Hiking nearby, waterfalls, music festivals, winery. Onsite there are puzzles, board games, books, lawn games, pond fishing, river fishing, river access (We floated on tubes). 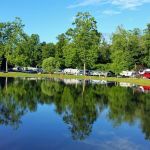 If you are ever in North Carolina with your RV, be sure to check out this campground. Very nice park, The workers there were very helpful, We stayed in what I found out was a previous seasonal site backing up to the river which was very nice my only complaint if you can call it that from giving it a "10" rating is the amount of Seasonal sites versus weekend/transient sites that are available. We camped at Mountain River Family Campground (formerly Secluded Valley RV CG) in a Travel Trailer. Visit Linville Falls it's only 9 miles away from the campground. Was at this campground for a weekend. Check in was easy and we were led to our campsite. Owners are very nice and helpful. Saturday night they invited all campers to a community camp fire for s'mores they provided. Nice fellowship on a cool clear night by the fire. We were in site 39 which is right beside the North Toe River. Really nice listening to the river run with our windows open on the camper. Very relaxing and peaceful atmosphere. The only reason I did not give this campground a perfect 10 is the WiFi was nonexistent by the river. I asked the manager about the WiFi and he told me which network to use but it would never come up as an option on my iPad. Verizon signal was pretty much nonexistent as well. It fluctuated between a weak 3G and 1x signal. 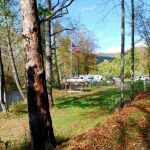 We camped at Mountain River Family Campground (formerly Secluded Valley RV CG) in a Fifth Wheel. 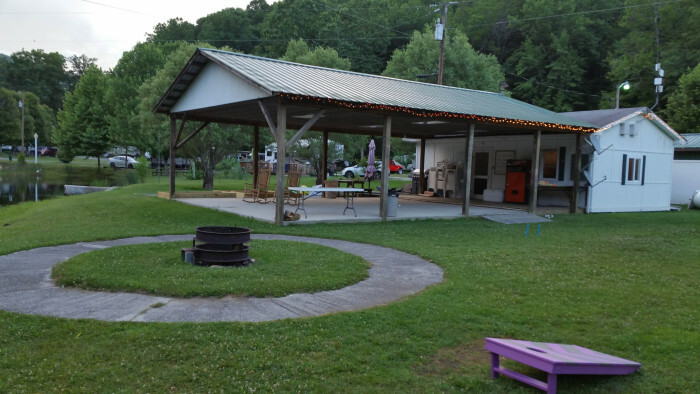 Formerly known as Secluded Valley Family Campground, the park is under new ownership. We have camped here for the past two seasons and have found it to be a beautiful, quiet, family oriented campground. We camped at Mountain River Family Campground (formerly Secluded Valley RV CG) in a Travel Trailer. Great place to camp. Stream and pond for fishing. Friendly owners. Verizon worked great. Wifi just Ok. No problems getting in or out in 40 ft motor home. We camped at Mountain River Family Campground (formerly Secluded Valley RV CG) in a Motorhome. This campground has a great deal of appeal. It is indeed in a secluded valley with a stream running along one side and a small lake in the center. We had a back-in site located by the stream with full hook-ups and 50 amp electric. There is free WiFi that is usable but just barely. The driveways and site pads are gravel. Bathrooms are "rustic" but OK. We were not able to get AT&T service here. 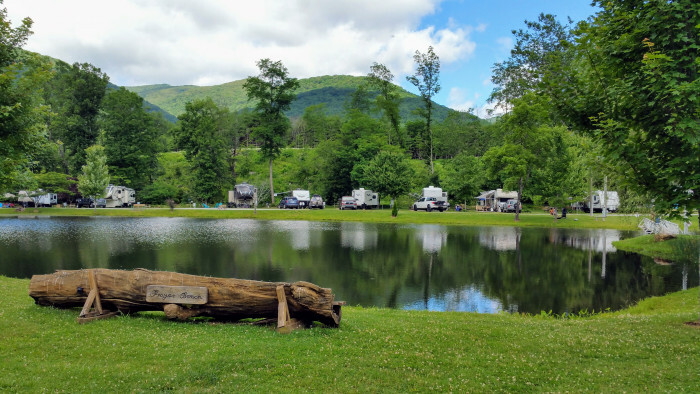 Nothing fancy but this is a nice, quiet campground in an appealing location about 5 miles from the Blue Ridge Parkway. We paid $34 per night. We camped at Mountain River Family Campground (formerly Secluded Valley RV CG) in a Motorhome. We arrived about a week after they opened for the season and the grounds were clean. A caretaker is on duty during the winter months and maintain the facilities. The sites to the east seem to be the better sites that can provide an horizon for satellite TV. These sites are generally reserved for returning summer campers. The sites have cement pads. Washers and dryers are available. Wi-Fi was not operational yet. Campground is in a beautiful location. We camped at Mountain River Family Campground (formerly Secluded Valley RV CG) in a Travel Trailer. Town of Spruce Pine is about 5 miles away with restaurants, Walmart and grocery stores. AT&T phone service was not available at the campground but was available in town. Beautiful setting on the North Toe river. Nice size grassy sites with plenty of privacy. 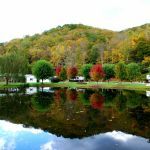 Very convenient to shopping in Spruce Pine and close enough to Grandfather Mtn., Linville Falls and Gorge as well as Roan Mountain. No cell service and minimal ota tv. I could get tv on my dish. The bath house was clean and convenient by very cramped. We camped at Mountain River Family Campground (formerly Secluded Valley RV CG) in a Travel Trailer. Grassy Creek Golf course was in very good shape and very affordable. Grandfather mountain is pretty pricey-$20 per person. Wisemans view is spectacular as is the top of Roan Mountain. Our site had a great view of the lake and lots of space. It was pretty level gravel but we did need one board to level. The concrete patio was longer than our awning and the picnic table was on a bricked area. We had a fire ring in back. The whole park is very neat and clean. Many seasonal campers but their sites were well kept. The owners were very friendly and offered assistance any way they could. Would have rated a 10 except the Wifi did not work very well. The rate included tax. We will camp here again. We camped at Mountain River Family Campground (formerly Secluded Valley RV CG) in a Fifth Wheel. We hiked at Linville Falls less than 30 minutes away. Great place, family atmosphere. Nice fishing pond. Lots of seasonal rentals which seem to come back every year. Sites are spacious and partially shaded. Restrooms are older but kept clean and in working order. We camped at Mountain River Family Campground (formerly Secluded Valley RV CG) in a Fifth Wheel. We had a great stay. The grounds were well kept and the bathhouse was clean . The owners were awesome. Arrived after dark and they escorted us to our spot and made sure we had everything to get connected. Walmart is about 15min drive into Spruce Pine. About 25 Min to Wiseman's View (Brown Mtn Lights). My family had a blast. Can't wait to go back! We camped at Mountain River Family Campground (formerly Secluded Valley RV CG) in a Travel Trailer. We have just returned from a weekend camp with 4 other travel trailers in our group. We found the campground to be immaculate and very well cared for. The owners/hosts were very friendly and helpful. All the sites are set for 50 amp service, but the owners have adapters to change to 30 amp which they will let you use at no cost. 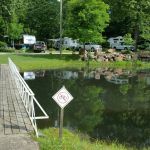 There is a large stocked fishing pond in the center of the campground and a river running along on side. Most of the sites on the river side were taken by seasonal campers, but because they were not allowed to put up permanent structures on the sites they didn't appear to be seasonal and everyone's site was very well kept. There is a small playground for younger kids and the river is great for tubing and fly fishing. Most of the sites have a concrete patio. The sites are gravel filled and level. Next to the fishing pond there is a small pavilion with a kitchen, laundry room, and library. There is also a community campfire ring that is lit at 7:00 pm each night. Because some of our group were not in adjacent sites, we asked if we could have the use of the pavilion for our Saturday night group dinner and the owners/hosts agreed to allow this at no extra charge and even allowed the use of a couple of the tables. 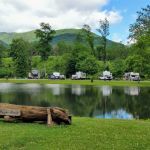 If you are looking for a quiet and peaceful getaway, not far off the beaten path, but where you still have that woodsy feel this would be a great campground for you. Our camping group the VA Vagabonds have voted to return to this campground (something that happens very infrequently in our group) in the future. We camped at Mountain River Family Campground (formerly Secluded Valley RV CG) in a Travel Trailer. 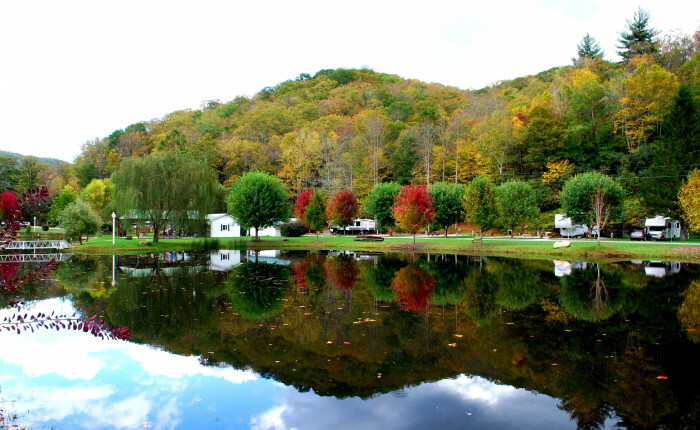 Are you affiliated with Mountain River Family Campground (formerly Secluded Valley RV CG) ?